Six months ago over the Christmas holiday I downloaded WSJT-X to give FT8 a try. Since quite a lot of CW and SSB activity has moved to this new digital mode, in particular on VHF, it seems inevitable that I would take the plunge eventually. Also with a background in software and experience developing commercial applications using DSP and statistical analysis the technology alone was of great interest to me regardless of whether I would ever use it on the air. The amount of activity was surprisingly high on every band that was open. On 160 meters there were numerous European stations on 160 meters when there was no CW signals present. Most of the calls were unfamiliar, indicating that FT8 either draws more hams to try top band or that FT8 allows smaller stations to be more successful. On 6 meters stations were copied when I had no particular reason to believe there was sporadic E present. On the HF bands the FT8 windows were crowded. Based on the signal reports being exchanged the majority of signals would have been comfortably copied on CW. But since you can't predict signal strengths in advance this is not a slight against FT8 versus traditional modes. After a week of fooling around I pushed WSJT-X aside without having transmitted once or made any QSOs. It was peak DX and contest season and I was not willing to spend more time with it. Its time would come, I knew, when the peak sporadic E (Es) arrived in late spring. The migration to FT8 on VHF has been so profound that it would be that or miss a substantial amount of activity, especially DX, which is my particular interest on 6 meters. In late May I became serious. After some experimentation I had the FTdx5000 working well with WSJT-X 1.9 and began making QSOs on June 5. I made my first QSO on 10 meters since propagation did not favour 6 meters when I was ready to go. As is my bent the first QSO of course had to be DX! Now familiar with the software and certain I had everything hooked up correctly I exited HF entirely to focus on 6 meters. Indeed as I write these words that first FT8 QSO is my only one on HF. It may be a long time before there's another in my log. My sole motivation to try out FT8 is the wholesale migration of DXing activity on 6 meters from CW and SSB. Whether one likes it or not that is where the activity resides. This became very evident in 2017 and was certain to be even greater in 2018. 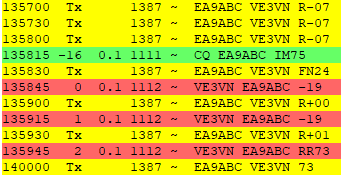 While I had nothing against FT8 there seems something overly artificial about QSOs that fully rely on machine coding and decoding. This is a common sentiment among many hams. It was therefore with only middling enthusiasm that I took the plunge. The technology itself is fascinating and delightful, and that pushed me along. My appreciation is in part because I have developed commercial DSP (digital signal processing) software. There is an undeniable urge to learn what far better minds than mine have been able to accomplish in developing FT8 and similar digital modes. But would it work for me? Could I learn to enjoy FT8? Would DX fill my log? That is, would I work DX on FT8 only because that's where the activity is or because it delivers superior results? The only way to know for sure was to become active and stick with it through the sporadic E season. Before continuing I'll tell you now that my expectations were met. However it is not all roses. As I write these words I've been on 6 meters FT8 for 3 weeks. In that time I have primarily focussed on DX, but also North America west coast and Mexico as conditions dictated. A few times I ran shorter distance stations to improve my skill using WSJT-X. It's quite easy, just click, click and click some more, and watch the log fill with QSOs. Although it can be boring I usually fill the time by browsing the internet, eating or skipping away for a few seconds at a time to do small chores. It's a very different kind of amateur radio than I'm accustomed to! In these past 3 weeks I've worked close to 170 stations (no dupes), with 40% of those outside of the US and Canada. I haven't counted countries but there are quite a few, many of which are new for me on 6 meters. Stations I've copied or almost worked range from JA to OA to OH to 4X and TY. For the longest of paths the opening might last no more than one 15-second transmission, never to be heard again. FT8 is a bit of a tease that way. Despite the frustration it is fascinating to watch what is getting through. I often leave the station monitoring 50.313 or 50.323 MHz when I am busy elsewhere and see what the propagation delivered while I was away. Usually there little to see while other times I am appalled at the opening I've missed. For example, the JA opening seen in the adjacent screen capture. It lasted 7 minutes with over two dozen Japanese stations copied. But I wasn't there to work any of them. Oh well, there's always next time (or next year). The briefness of so many openings -- shorter than it takes to conduct an FT8 QSO -- may seem unreasonable yet this is not really true. Although it is true that a CW or SSB QSO can easily be completed far faster than FT8 and thus benefit from ultra brief openings you have to be in the right place at the right time to do it. This is quite difficult though I've done it numerous times. It makes me wonder whether one of the fast modes would be more suited to DXing on 6 meters. Perhaps MSK144 that is used for communication via meteor scatter pings. With FT8 you monitor the entire "band" at once and can see and respond to one of these micro openings in seconds. In a typical east European opening there can be dozens of these in quick succession. Of course one to two minute QSO may be too long to fit into the opening but at least you have a chance. Most often on CW and SSB you would never even notice the openings and so work nothing at all. On balance FT8 wins this contest, in my opinion. Birds flocking together in the fall are a good analogy to 6 meter FT8 DXers. After days of false starts somehow consensus is reached and the flock takes off together to begin the migration south. In the same fashion everyone congregates on 50.313 MHz until the unspoken signal is given and we all make the move to the intercontinental DX window. What is that signal? One that motivates me is exemplified by the above spectrum view. In good openings the standard FT8 window fills with many signals or a few very loud ones. When this happens our receiver's AGC gets busy protecting us against excess IF amplification and distortion. This effectively desenses the front end and can render weaker signals undecodable. In a pinch you can use a narrow filter. Most of the time that is a poor solution since you may not know the DX station's frequency or you'll miss new ones. When copy of weak transitory signals becomes difficult or uncertain that may be the time to QSY. Like those birds they'll individually rise up and look around and if they like what they find they'll keep flying. Eventually a tipping point is reached and the entire flock of DXers moves. In my short experience the whole process takes only a few minutes, including most stations on both ends of the intercontinental path. It's a fascinating study in human psychology. One fact that jumped out at me immediately is that few of the call signs I've heard on HF and VHF were familiar. Often one hears many of the same stations every day on CW and SSB. I was intrigued by the presence of many hams I would not otherwise hear. I like that. It gives a DXer like me a whole new set of stations to work. There are of course also many recognizable calls, hams who are active on CW and contesting. It makes for quite a mix. Obviously this latter group remains active on both digital and traditional modes. Perhaps they are experimenting with FT8, like me, or have made it a regular part of their activity on HF. Despite criticisms of FT8 as being machine to machine (partly true) if it gets more hams active that's a good thing. Whatever I may think of FT8 from a philosophical perspective it is now necessary to pursue DX on 6 meters. Being stubborn or a curmudgeon about it does not put DX in my log. It is yet too early to tell how this in combination with the aging out of the older generations will change amateur radio. During my short time on FT8 I have learned quite a lot. Some of it is covered by others, such as in ZL2IFB's excellent guide, though oriented more towards HF where propagation lasts longer than mere seconds. Others I have learned on my own, though all are probably documented by others, somewhere, if you know where to look. I find WSJT-X documentation silent on many questions I needed answers to. The following are a few of the things I've learned. These points are oriented to 6 meters, especially DXing, and so may not be useful to everyone. Perhaps some will be of use to you. Decode errors: Although FT8 uses FEC (forward error correction) its algorithms are so aggressive that it is not uncommon to see messages such as the one at right. The more aggressive you dial up the algorithms the more of this you are likely to see. The phantom signal usually has a very low SNR though not always. My first experience of decoded noise was RTTY in the 1970s. The random sequences could be hauntingly close to plain English. The resemblance to real messages is especially true with FT8 since the they are in essence just numbers that map to character sequences. Power: For optimal decoding of your signal at the other end your signal should have the minimum distortion. 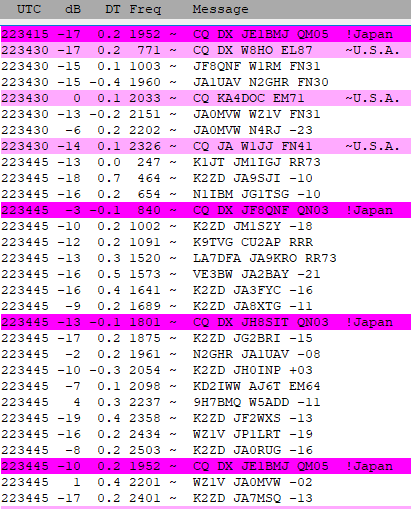 What is annoying but passable on CW and SSB does not work at all with FT8. From what I see on the WSJT-X spectrum display many haven't figured this out yet. I leave the rig power at 100% (200 watts on my FTdx5000) in SSB mode and use the WSJT-X power control to set the power output to no more than 50% (100 watts). There is no ALC action and the transmitter isn't stressed. Setting the rig power to 50% requires heavy ALC action and some distortion getting through. Since I use audio equalization the power varies with the transmitter offset, which may require fine tuning. Mode switching: I use SSB for simplicity in setup and tear down of cabling. Using the rig's digital modes and associated attachments can mean less fiddling with transmit controls when switching modes. For example I have to turn on VOX and disable the compressor for FT8 and reverse the process when returning to SSB. Happily I have fixed level jacks on the rig back panel for audio in and out for computer interconnection rather than having to swap cables when switching modes. The mic must be disconnected since it always mixes with the audio input from the back panel jack. Simplex vs Duplex: Many calling me transmit on the same frequency while I almost always call others on different frequencies. There is no simple rule. When you are confident there you are likely to be the only caller it can be helpful to go with simplex since the other station presumably chose a clear frequency. Otherwise duplex is the better bet. Respect directed CQs: When, for example, a station called CQ EU do not reply if you are not in Europe. That seems simple enough yet many call anyway. In the intercontinental segment at 50.323 MHz all calls are presumed to be for DX. Because some persist in calling anyway I turn off the Call 1st feature when I make a directed CQ and manually select a station to answer. I learned to do this when calling CQ DX on 50.323 MHz and my station automatically responded to a domestic caller. This brought out an over-enthusiastic policeman who DQRM'd the QSO. Disrespecting the band plan is unethical but DQRM is illegal. Avoid doing both, and especially the latter! Policemen: Speaking of policemen there are quite a few of those on 6 meter FT8. Who would have guessed. They hound non-DX QSOs in the DX window, harangue splatterers and those in the wrong time sequence, or simply broadcast what they believe are helpful messages. In their enthusiasm they forget to include their call signs. The policemen, too, have migrated to FT8 from other modes. Timing: There is no consistent use of even and odd slots on domestic QSOs though there are conventions. When DXing respecting time slots becomes important. The simple guideline proposed by the UKSMG (UK Six Meter Group) is largely adhered to and works well. Don't expect to work much DX if you transmit in the same time slots they use! When everyone respects the time convention you'll notice that spectrum display is empty on even slots except for those weak European signals. When they all mix together on 50.313 MHz the QRM often renders weak DX signals unable to be decoded. Multiple callers: By not using Call 1st the CQing station can choose who to respond to, at the price of having to be nimble with the mouse. If the desired station is using Call 1st, which is most common, it can take multiple attempts to get through, if the propagation holds for many minutes. This can be gamed to get through sooner by noting that Call 1st is with respect to WSJT-X decoding order. From observation the decoding order is determined by frequency and number of required decoding passes. If you signal is reasonably strong you should transmit well below the desired station because you'll be decoded first! When it takes a second pass due to QRM or propagation phase distortion you'll lose out to someone else. Although not a guarantee the tactic does work. Calling etiquette: When the CQing station responds to another station some keep calling throughout the QSO while others tail end (after 73 or RR73), while still others are silent until a subsequent CQ is sent. Continuous calling seems impolite to me even though it really doesn't cause harm other than to fill the other station's screen with a few extra messages. Consensus on this point seems elusive. RR73: Many CQing stations use RR73 rather than RRR to complete the QSO to, presumably, speed the QSO. Unfortunately that doesn't necessarily work. RR73 ought to be used only when signals are strong otherwise WSJT-X will resend it if the expected 73 is not received. But after the caller sends 73 and another RR73 is received the 73 message is not automatically sent since the transmitter is disabled. It must be sent manually, which wastes at least another 30 seconds if you are not very quick with your hands. For the present I avoid using RR73 when I respond to callers to my CQ. Another speed technique is to send a signal report as the first message rather than one's grid. It seems to work well for brief DX openings although it may irritate those who collect grid squares. NA contest mode: There is one, much to my surprise. During the ARRL VHF contest some used it and some didn't, resulting in mass confusion. I hadn't even heard of it at the time and could not understand the peculiar exchanges (I still don't) which I could not find in the WSJT-X manual. So I avoided FT8 during the contest. Some operators forget to turn the feature off after the contest. Aurora: Forget it. The auroral curtain causes rapid frequency (Doppler) and phase shifts that defeat all attempts to decode FT8 of reflected signals. The decoding algorithms in WSJT-X are impressive but even they cannot "put Humpty Dumpy back together again." Switch to CW. After a month of FT8 activity I am prepared to decide whether it's for me. On HF, no. At best I like it as a type of beacon network to tell me if there's propagation. On 160 meters I can see that it could be interesting, so come this fall I will likely give it a try. But DX only. For 6 meters I find it useful, interesting and I almost but not quite have enthusiasm for it. With it I am near certain I am able to work far more DX and capitalize on marginal openings. Sure, being able to monitor all activity simultaneously is a bit of a cheat. However it is not all that much worse in that sense than using the spotting network. It's like having my own CW skimmer. For a long time ham it only requires some getting used to the difference in operating style. It's hard to argue with a log containing dozens of DX contacts over the past few weeks. 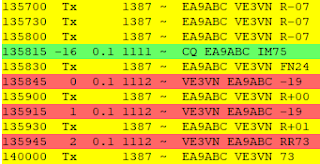 I have no doubt they are real QSOs, no worse than what is typical on all bands and modes. The worst thing about FT8 to my mind is the boredom. Sitting in front of a screen watching the green bar advance one slow second after another is very tedious. Yet you must have quick reactions to respond to a station in the 2 or 3 seconds after decode to hit next 15 slot. Miss it and you lose 30 seconds (or much more if someone else works the station you want), and that can easily mean missing the contact entirely due to the short openings for the longer DX paths. I liken it to baseball where most of the time you stand around doing nothing and a small amount of time moving like lightning. Your vigilance must not waver. When the time comes you must react very quickly and do everything properly despite the need for speed. You often don't get a second chance. At least the 6 meter sporadic E season is short. I think I can put up with the negative aspects of FT8 for a month or two in order to work the DX. Time will tell. It may not even matter what I think if the mass migration to FT8 on 6 meters holds. One night during a great opening I moved to CW to relieve the tedium. The one QSO per minute I sustained for 20 minutes was a welcome change. Compared to FT8 that's a fast rate. After the CW run I switched to SSB and worked a few more before settling into a rag chew with an old friend. Difficult to do that on FT8. Each mode has its quirks and benefits. FT8 fits well into the 6 meter operator's repertoire. My 6 meter station is the same as it was last year and changes will not happen until next year. Although the sporadic E season is only a little more than half over I am too busy with other projects to improve my equipment. My antenna is big, high and working well, I've made the move to FT8 and the DX is rolling in. That's sufficiently satisfying for this year. There are two deficiencies I would like to deal with. The first is the transmission line. It's an ancient 40 meter run of RG213 that is very lossy at 50 MHz. The matched loss for pristine RG213 would be -2 db and perhaps another -0.3 db due to the low SWR. It measures almost twice that loss due to its age-related deterioration. That's a lot! Ancient RG213 may seem a strange choice since I have ample amounts of LDF5 and AVA7 Heliax. However the Heliax is slated for long runs to and up big towers for HF antennas. I will not allocate a precious 40 meters of it until I have more in hand. HF contests and DX are higher priority. The second deficiency is power. It is sometimes (and falsely) claimed that FT8 is best suited to low power, even QRP. Of course low power is often all that's needed, but that's equally true for other modes. For the majority of CW and SSB QSOs you could turn your power down to 5 watts and still be solid copy. Of course almost no one does that. When it comes to brief and marginal DX openings on 6 meters power comes in very handy, whatever the mode. 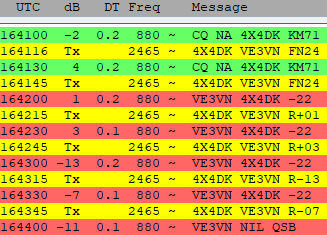 Many FT8 DXers on 6 meters run high power and it delivers results. When I do purchase an amplifier it would be nice if it covers 6 meters. This isn't mandatory. I am willing to delay or forgo high power on 6 meters if the amplifier I want is available at the right price and only covers HF. As an interim measure improving the coax next spring will give me the equivalent of several hundred watts. An amplifier is not my foremost need.